Arsenal Football Club is an English professional football club based in Holloway, London, who currently play in the Premier League. One of the most successful clubs in English football, it has won 13 First Division and Premier League titles and 10 FA Cups. Arsenal holds the record for the longest uninterrupted period in the English top flight and is the only side to have completed a Premier League season unbeaten (in the 2003-04 season). Arsenal was founded in 1886 in Woolwich and in 1893 became the first club from the south of England to join the Football League. In 1913, it moved north across the city to Arsenal Stadium in Highbury. In the 1930s the club won five League Championship titles and two FA Cups. After a lean period in the post-war years it won the League and FA Cup Double, in the 1970–71 season, and in the 1990s and first decade of the 21st century won two more Doubles and reached the 2006 UEFA Champions League Final. Arsenal has a long-standing rivalry with neighbours Tottenham Hotspur, with whom it contests the North London derby. Arsenal is the third most valuable association football club in the world as of 2010, valued at $1.2 billion. For most of their time in south-east London, Arsenal played at the Manor Ground in Plumstead, apart from a three-year period at the nearby Invicta Ground between 1890 and 1893. The Manor Ground was initially just a field, until the club installed stands and terracing for their first Football League match in September 1893. They played their home games there for the next twenty years (with two exceptions in the 1894–95 season), until the move to north London in 1913. Widely referred to as Highbury, Arsenal Stadium was the club's home from September 1913 until May 2006. The original stadium was designed by the renowned football architect Archibald Leitch, and had a design common to many football grounds in the UK at the time, with a single covered stand and three open-air banks of terracing. The entire stadium was given a massive overhaul in the 1930s: new Art Deco West and East stands were constructed, opening in 1932 and 1936 respectively, and a roof was added to the North Bank terrace, which was bombed during the Second World War and not restored until 1954. Highbury could hold over 60,000 spectators at its peak, and had a capacity of 57,000 until the early 1990s. 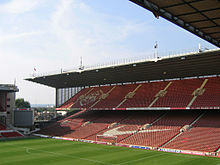 The Taylor Report and Premier League regulations obliged Arsenal to convert Highbury to an all-seater stadium in time for the 1993–94 season, thus reducing the capacity to 38,419 seated spectators. This capacity had to be reduced further during Champions League matches to accommodate additional advertising boards, so much so that for two seasons, from 1998 to 2000, Arsenal played Champions League home matches at Wembley, which could house more than 70,000 spectators. Expansion of Highbury was restricted because the East Stand had been designated as a Grade II listed building and the other three stands were close to residential properties. These limitations prevented the club from maximising matchday revenue during the 1990s and first decade of the 21st century, putting them in danger of being left behind in the football boom of that time. After considering various options, in 2000 Arsenal proposed building a new 60,361-capacity stadium at Ashburton Grove, since renamed the Emirates Stadium, about 500 metres south-west of Highbury. The project was initially delayed by red tape and rising costs, and construction was completed in July 2006, in time for the start of the 2006–07 season. The stadium was named after its sponsors, the airline company Emirates, with whom the club signed the largest sponsorship deal in English football history, worth around £100 million; some fans referred to the ground as Ashburton Grove, or the Grove, as they did not agree with corporate sponsorship of stadium names. The stadium will be officially known as Emirates Stadium until at least 2012, and the airline will be the club's shirt sponsor until the end of the 2013–14 season. From the start of the 2010–11 season on, the stands of the stadium have been officially known as North Bank, East Stand, West Stand and Clock end. Arsenal's players train at the Shenley Training Centre in Hertfordshire, a purpose-built facility which opened in 1999. Before that the club used facilities on a nearby site owned by the University College of London Students' Union. Until 1961 they had trained at Highbury. Arsenal's Academy under-18 teams play their home matches at Shenley, while the reserves play their games at Underhill, home of Barnet.